It's really cool to see what has changed and what hasn't! I don't know for sure if my first visit was '70 or '71. I know we went to Eureka Springs in '69, and we had been going to SDC for at least a couple of years before we moved, in '73. It looked just like that, though. It would have been in a Dodge Dart, too... only white instead of black like that one. Here's the story. My grandparents lived in Pittsburg KS most of their lives. When Grandpa passed away, my parents got all his old home videos. 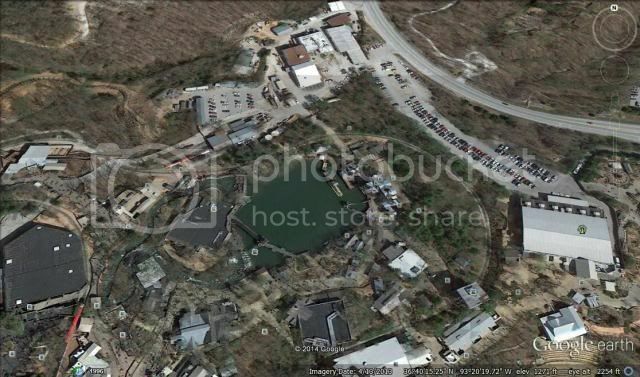 They included some from the early 60s at SDC, SOTH and I believe Table Rock Dam. I need to get some decent software on my computer in order to pull down the videos. Any recommendations? Can't give tech advice, but I am looking forward to seeing the vacation films! LOVE IT! I really like around 3 min at the Hold up Scene on the train when you can see a car driving by! I actually had to go back and look at that when I was watching it last week. I saw that car, and even pointed it out to my daughter. My grandpa made home movies with that camera until the late 70s. I will see what else I can find. I just rewatched it and saw that this time. Why is that? When was the train route near a road and what moved? The train or the road? In the early days, the train was a smaller one than the trains used today. It was easier to run the train in the opposite direction on the tracks because of the grade. The robbery skit was initially added so the train could stop and build up steam for the return trip. The road you see is Highway 76. The tracks run pretty much the same route they do today, but the trees were smaller, and underbrush was cut down, and there were no big board fences like there are today, that's why you see the highway so well. Sometime in the 1990's, they actually re-routed a section of Highway 76, moving the road back away from the park a bit from the intersection with Indian Point Road and westward a short distance. By moving the highway, it gave SDC space to put in the back side of Grand Exposition. The old road bed is now an employee parking lot. If you do a Google Maps check, look at that area of the park, and you will notice the old pathway of Highway 76, and the employee parking lot by Red/Gold Hall...you will see what I'm talking about. I don't think this is any earlier than 1963. The train was added in 1962 and it did run in the opposite direction. The train depot shown in the film is the earlier one. The swinging bridge was added in 1963 because the parking lot was moved from the square to the area where Christmas Hollow (used to be woodcarvers) and the Flooded Mine is now. SDC was free then. You just walked across the swinging bridge and you were there. There was an admission charge for each ride/attraction but it wasn't much. here is one from 1967, just uploaded back in March, only 34 views.